After what seemed like an eternity, once we finally had our permits in hand we dug, formed, and poured footings for the south wing in three days. The south wing is 38'8" x 22'8". The footings themselves were 3.5' wide and 12" deep into solid rock that we had to bust up with a breaker on the bobcat. The stem walls are 16" wide to accomodate the double block walls. Vertical hooked dowel bars are spaced 16" on center for both sides of the block walls. We poured 25 yards of a low slump concrete mix that included 1" gravel and a fly ash blend. We wanted the low slump both to increase the strength (low water cement ratios make stronger concrete), but also because we needed to pull stakes and strip the spreaders on the day of the pour. When working with concrete block, you want the top of the stem wall flat and clean, ready for the block mortar. As in our rammed earth and pise walls, we needed to give a lot of thought to the electrical runs. 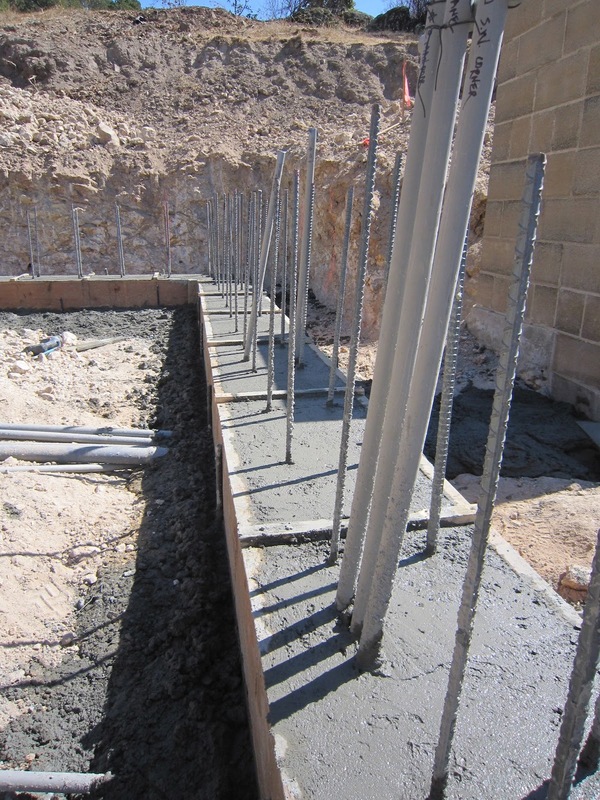 In some regards, working with block requires even more forethought than rammed earth, because you have to locate conduits in block cells and in bond beam courses. You can see in one of the attached photos the grouping of conduits running into and out of the location for the sub panel. We started our pour at noon and were cleaned up and watered down by five. The crew was five people.